As I have mentioned previously I was very conscious in writing Newton’s Ark to keep the science as real as possible. The most speculative technology I included was probably the micro fusion reactor – a small, highly portable fusion reactor that could power a satellite for decades. This technology requires us to find a way to build a self-sustaining fusion reaction that produces positive net energy. And then you have to miniaturize it – I’m going to ignore that challenge assuming we can solve the main problem. This technology has been a decade away for the past sixty years. Will we ever solve this problem? Who knows. It may really be a only decade away, it may be another sixty years away or it may never happen. It’s hard to extrapolate from the experience to date. There has been some progress but not enough to be completely confident that the fundamental challenge can be overcome. It is still an active area of research though. In fact I recently received an assignment to design a biometric security system (iris recognition) for an experimental fusion reactor facility! This post brought to you by author of Newton’s Ark, D.A. Hill. 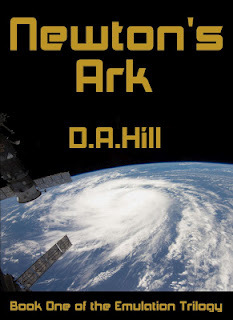 I posted recently on keeping the sci fi real in my first novel Newton’s Ark. I just ran across this article about stopping an asteriod specifically debunking the scenario presented in the movie Armageddon of using a nuke to split it in half. …fiction is all about the make-believe. But good science can make for a more plausible narrative, making it easier to suspend disbelief. This post brought to you by author D.A. Hill. One of the things I set out to do when writing Newton’s Ark, was to keep the science part of the science fiction plausible, by basing the technology of the future either on already emerging technologies or at least on plausible projections of current technology trends. This article on taking control of drones by spoofing GPS signals is a good example.